Are you looking for instruction manuals on how to build a rabbit hutch? Or are you seeking helpful tips to aid you in building your own rabbit hutch? If your answer to any of the above question is yes, your search ends here. In this article, you will get to know the tips and steps on how to build a rabbit hutch. 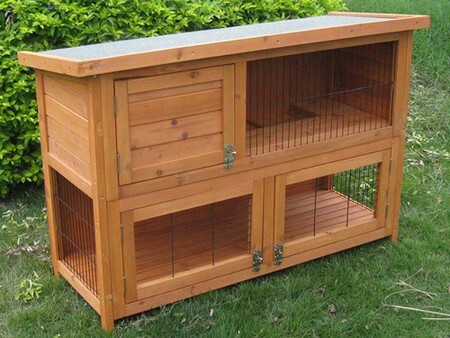 Rabbit hutches are made to replace the natural habitat of home reared bunnies. They should be cozy and large enough to accommodate the number of rabbits you have, as well as protect them from bad weathers if they are kept outdoors. By judging from the number of rabbits that you have, sketch a plan for the hutch with sufficient space for all of them. Rabbits reproduce quickly and you will want a larger rabbit hutch if you are planning to breed them. Estimate the measurements of the hutch and the amount of materials that you will need. Do consider using galvanized wire mesh or treated wood pieces instead of plywood as untreated wooden materials will absorb urine and water. It affects the cleanliness of the environment and it might cause the spread of diseases. Wooden hutches are also not as long lasting and easy to clean as galvanized wire mesh cages. When you have gotten all your materials, you may start with the frame of the hutch. Secure the base piece and one of the side pieces together to form an L shape, and nail them together. For the base piece, you can use a large piece of wired mesh clamped in a wooden frame. The droppings will fall to the ground instead of soaking into the wooden base. Repeat the same step with the opposite side piece. Next, nail the back and top piece to the U shaped frame that you worked with earlier. You may want to sand the inner parts of the treated plywood sheets. For the doors, lay a piece of mesh that is cut according to the measurements of your door and nail one side between two pieces of plywood. Repeat the same step with the other 3 sides. It should look like a mesh wire window with wooden side panels. Attach the door to the front of your main frame and affix the latch. A good rabbit hutch should have good air ventilation. Lastly, affix a hinged roof top and four legs to the frame. Hammer the legs to the ground where you would like to place the hutch. You can also consider adding some extra accessories to the hutch, for example, a retractable pen to collect the waste of the rabbits so that cleaning up is easier for you, or maybe a partition. This is basically how to build a rabbit hutch. 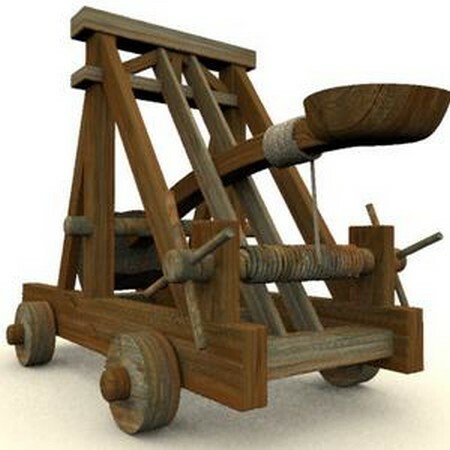 Anyone who’s even remotely interested in medieval warfare would surely be interested in knowing how things like giant catapults were built and used. 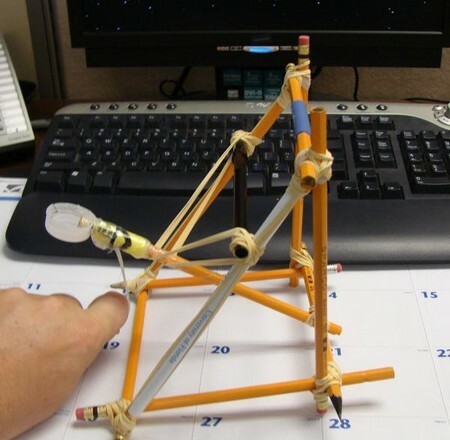 While it may not be possible for all enthusiasts to possess the space and budget to build a full-sized catapult, you can still learn how to build a catapult on a miniature scale with materials available from the hardware or stationery store. The first section to be constructed is the frame of the catapult itself. This is done by attaching a piece of wood measuring up to 12 inches in length and an inch wide to a second, shorter piece of wood measuring up to 6 inches long and an inch wide. The ends of the shorter stick should be shaved at 45-degree angles. The sticks can be screwed, nailed or glued together so that they form a slanted L-shape with a 45-degree angle. Another 6-inch long stick with square ends is attached to the first two sticks to form one side of the frame. What you’re looking for is something shaped like the letter “A”. The second side of the frame is fashioned in the same way. If you used glue to attach the sticks, allow it to dry before proceeding. Now, connect one of the uncut sticks to the long stick and the 45-degree-cut stick. The end of this stick should be placed squarely with the long stick so that it can stand. This would now form some thing like a letter “A” on its side. The frame is assembled by attaching one 6-inch stick to the ends of the 12-inch sticks to connect them, connecting the two 6-inch sticks 45-degree angle-ended sticks with another 6-inch stick, and doing the same with the square-ended 6-inch sticks, which form the upright portion of the frame. The next part of learning how to build a catapult is to make the launcher. The launcher is the made with one 12-inch stick that has had a hole made in one end, about 3 inches from the end. This hole needs to be slightly wider than the 6-inch metal rod to be used later. A small screw hook, about one centimeter in size is screwed to the other end of the stick about 2 inches from the end. The container or basket that holds your ammunition is to be attached on the other side of the stick, nearer to the end. The launcher is connected to the frame with the metal rod mentioned earlier. It is inserted into the hole made 3 inches down the stick and braced against the upright posts with some tape to keep it in position. A second screw hook is fastened to the base of the frame and in alignment with the first hook. A rubber band can then be stretched between the two hooks and released to launch the catapult. A column footing functions as a foundation to hold a structure in place and also to beautify the structure that it supports. 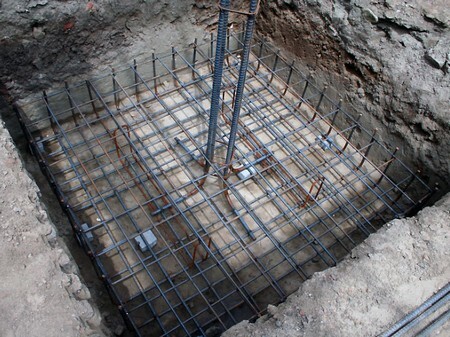 Previously, a footing or foundation is necessary to evenly distribute the overall weight of the supported structure. It was a feat to accurately measure the foundation. Today, it has evolved beyond functionality to become an aesthetic focal point. The column need not be used to support any major structure, and can even exist on its own, serving decorative purposes. 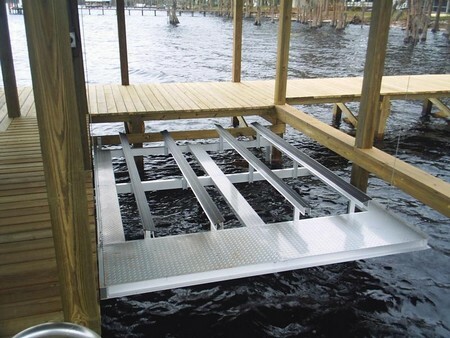 Therefore, before you determine how to build a column footing, determine its primary purpose. Will it be used to support a heavy structure? If so, the measurements must be precise. Is it for decorative and art purposes? If so, then you can be slightly flexible on the measurement. (1) Design a plan. It is the first step to help you stay on course when building and it serves as a reference point. Gauge the space needed, draw plan to scale, and add motifs to your design if relevant. The foundation can take on many shapes, not necessarily square or round. To prepare the column foundation, dig the marked area at least a foot deep. The hole should also be 2-3 inches wider than the base. This helps to prevent chipping. To form the frame, use a 2 x 4 inch board. Then, cut and fasten the plywood to it using form. Do use a glove when you cut the boards. Fasten a form on the outside of the frame to keep the cement in. Coat the panels using quick-dry rubber cement and allow some time for it to set. Use smooth cement to seal the frames below the edge and distribute another layer of graveled cement into the hole. After this step, you can place the column footing and allow it to set. Next, remove the frame and air-dry the column. If gaps are present, use smooth cement to seal the holes. You may also brush it with masonry brush to keep it smooth, or even give it a coat of paint. Otherwise, leave it as it is for a natural look. Lastly, remind yourself that this should be a relatively simple and stress-free project. Feel free to be creative and experiment with different ideas. With these steps on how to build a column footing, you are on your way to build a beautiful structure that will envy your neighbors. Deer is a popular animal, often sought-after for its meat. It is also a common practice to hunt them down during certain seasons. Seasoned hunters who are well versed with their movement patterns and dietary habits will be able to easily locate this animal. Nevertheless, another popular option to lure the animals out from the safety of their confinement is to use a feeder. Deer feeding is popular among hunters and in zoos. Deer feeder equipment can range from the simpler designs, to more complex ones equipped with timed-feeders. For those looking forward to hunt and also for those who intend to rear this animal, knowledge about deer-feeding is essential. Here, we will explore some of the ways on how to build a deer feeder. Firstly, decide on the number of animal that you intend to feed. 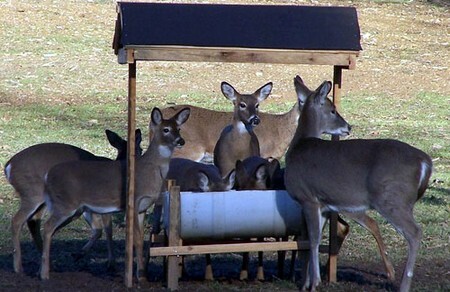 If your intention is to train a few deer, than a lower-costing backyard feeder will function well. However, if you intend to attract a larger herd, then your feeding equipment should be more sophisticated and attractive. You will need a trough for the feed, regardless of where you intend to place the equipment. A trough is a container specifically for animal feed. It should be large enough for the animal to access, while plain in design to avoid attention of predators. To keep the feed dry, you need to build a roof over the equipment. It should be high enough to accommodate longer posts built for taller animals. Also, do consider blowing rain that may wet the feed. A deer will feed only when it feels safe and there is no sign of predators. They will snack on the feed and move away from the area quickly as they are wary of predators. If you are building a large feeding area, you may want to include fences. They should be allowed to leap over the fence, while feeling safe from attack. For this, a timed feeder will be particularly useful. However, this will require higher cost as well as considerable amount of effort to construct. For simpler feeding stations, there is no need for foundation. Bigger stations require them to keep the station in place. To do so, all you need is to dig some holes and fill them with cement, water and sand. The station legs can be attached to the foundation using clips. They can be removed in the event of relocation. There are many other methods to build a feeding device and this is just one of the ways on how to build a deer feeder.